Finally, I'm back online. My server connection went haywire and then my friend from Milwaukee came for an extended visit. Our time together is intensely busy and I just couldn't face dealing with server problems while she was here. When I'm with my friend, Alicia, we always come up with ideas that end up as major projects. Usually we work on the same type of creation. I'll feature some of our parallel projects in future postings. This year she desired to make a kimono wall hanging for her living room. Here it is layed out for the collage technique that I use (tulle netting placed over loose pieces - the quilting holds everything in place). 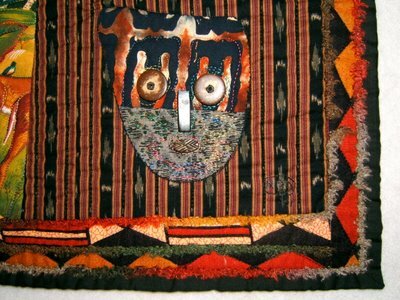 Most of the fabrics are silk remnants. 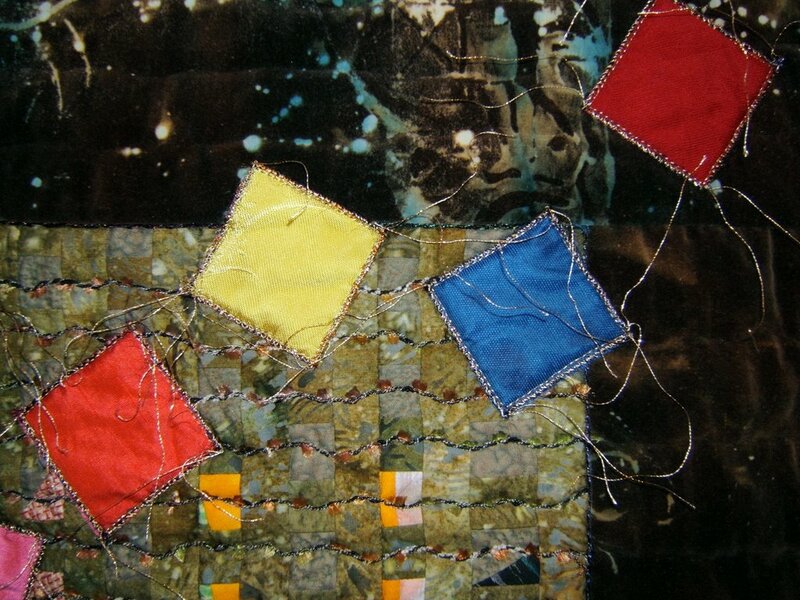 The small squares are small silk fabric samples that were cut even smaller. Here it is finished. 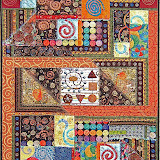 I contributed the free motion quilting. Otherwise, it's all her doing. Alicia is full of wonderful ideas,but lacks the facilities, materials and "know how" to execute them. 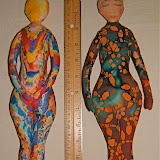 I'm most pleased to share my studio, stash of supplies, and knowledge to help her make them real. I miss having this exquisite piece hanging on my design wall. This piece had its beginning in the workshop, Twisted Ribbons, conducted by Ricky Tims in Pigeon Forge, Tennessee. 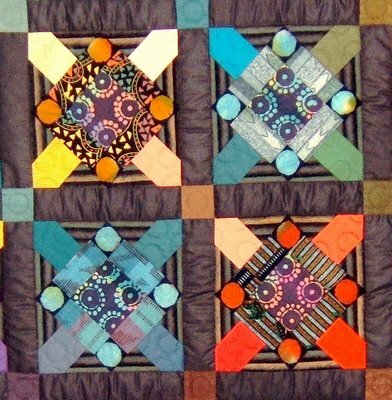 The objective was to learn curved piecing. I decided to choose my fabrics by value rather than hue to get the effect of a dimensional ribbon twisting through space. Those values were selected from pure hues to go on a muted background. I learned Ricky's technique, but the result was the ugliest, most garish thing I had ever made. 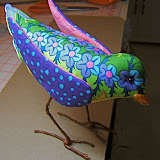 I cannot throw anything away ... there had to be a way to "recycle" this piece. I had also taken Ricky Tim's "Harmonic Convergence" class the same week, so decided to use aspects of that technique to salvage this piece. The ribbon piece's background was a fat quarter of batik fabric. I had another fat quarter of a similar batik. 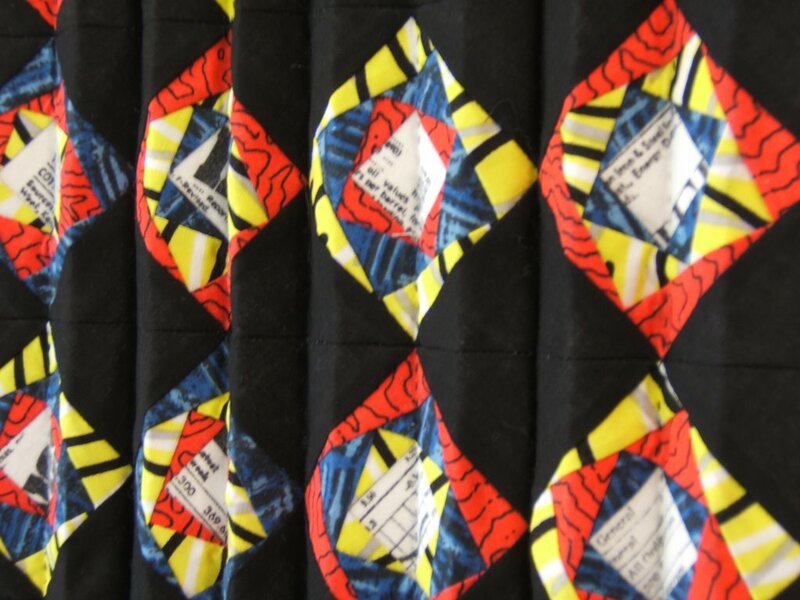 I cut the ribbon piece into 1" strips and inserted 1" strips of the new batik. 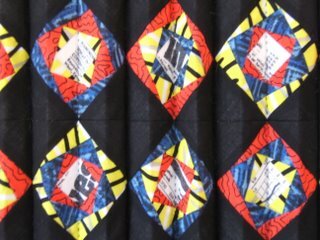 That helped, but it still looked awful, so I cut and stripped in more fabric from the other direction. That was better. Now, I don't recall if I cut and stripped in additional fabric one OR two more times. I mixed up the order of the ribbon strips in the process. I stopped cutting and sewing when I saw what looked like reflections of lights in river water to me. I needed something to cast those reflections. 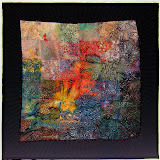 A dive into my stash came up with 2" squares of silk fabric samples. 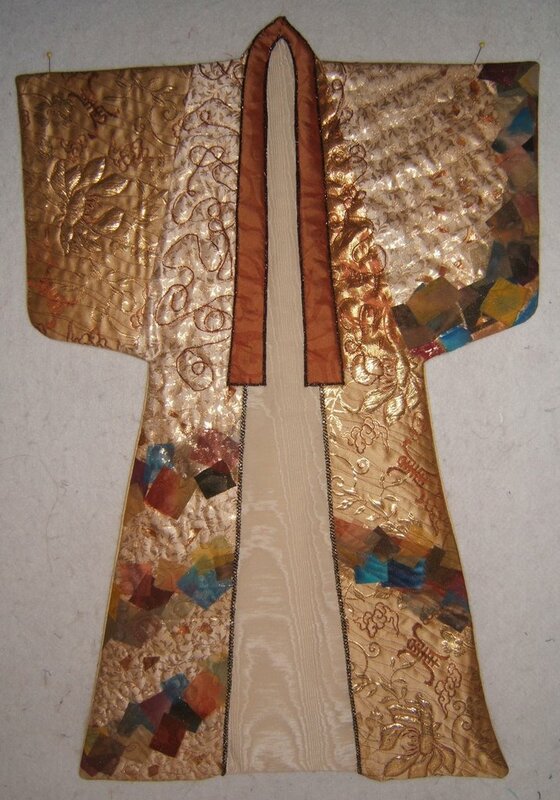 The gold metallic threads around the silk squares float away from the surface. Tails were left at the beginning and end of the zig-zag stitch seams on each side. 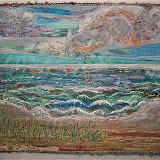 Yarn couched in a wave pattern is the quilting in the center panel. Since this obviously was "night" I needed a dark frame. 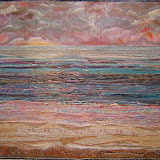 The velvet border fabric that was discharged (bleached) and painted by Jan Lewis of Evanston, Illinois was perfect. 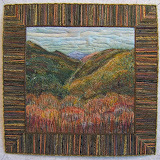 She had given me the piece in exchange for working out of my fabric stash at workshops we both attended at Arrowmont in Gatlinburg, Tennessee. 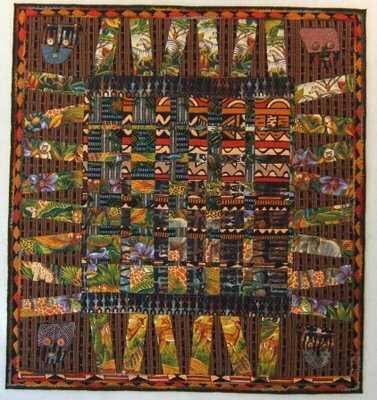 This piece is one of the few out of the 244+ quilts I've made over the last 12 years that I've kept to hang in our living room. 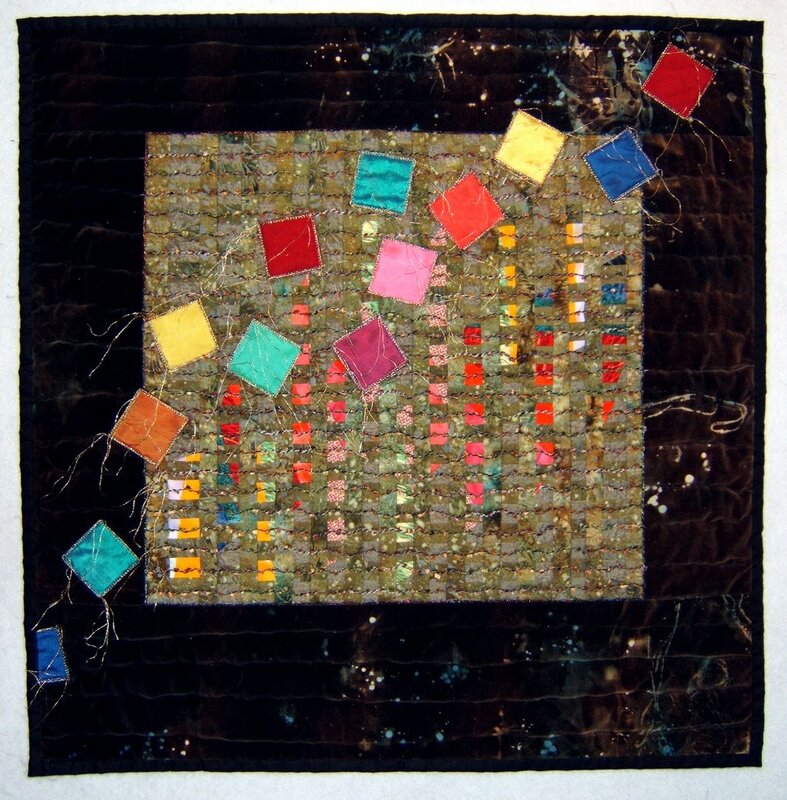 Its hanging space gets a rotation of a selected small group of quilts. I'll indicate which those are when they get described in the future. Toonga (an African word for adventure) is the second piece in my African series. 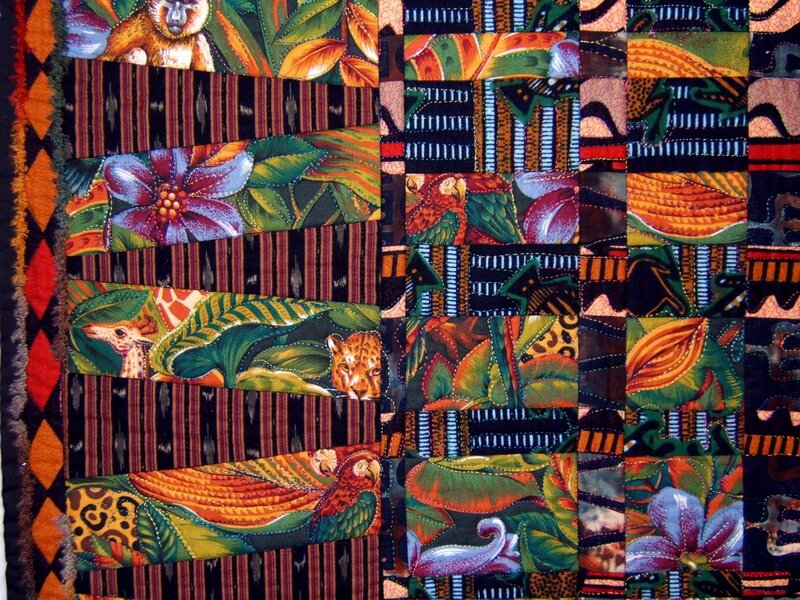 The fragmented images symbolize my perceptions of Africa ... from a jungle safari to structural and native patterns. I'm also fascinated by the way a herd of huge elephants move so quietly that their presence isn't known until you see them ... plus there is the camouflage of foliage and shadows. You hardly notice them at all in this composition. Machine quilted, machine pieced, hand applique. 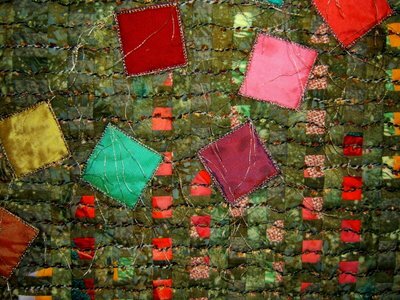 Yarns are couched to the surface with machine zig zag stitches. 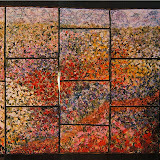 The center panel is pieced using Ricky Tims "harmonic convergence" contruction technique. 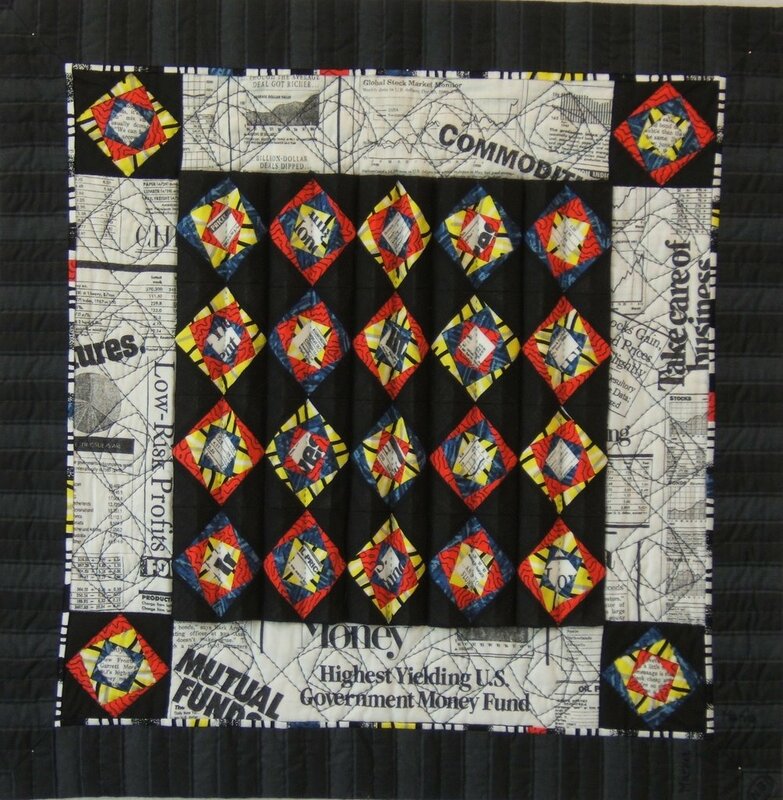 Description: Based on an 1898 block called Fort Sumter, from "The Quilter's Album of Blocks & Borders" by Jinny Beyer. 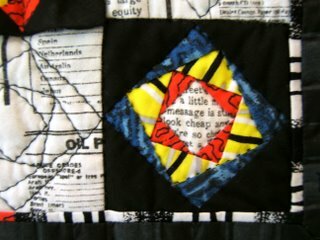 Techniques: Machine pieced and hand-quilted. 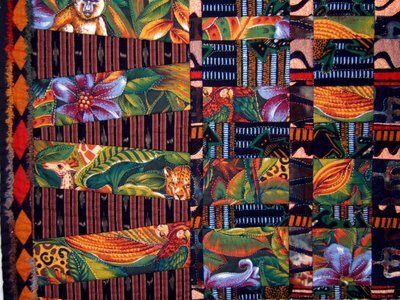 Materials: cotton, wool, and silk fabrics. 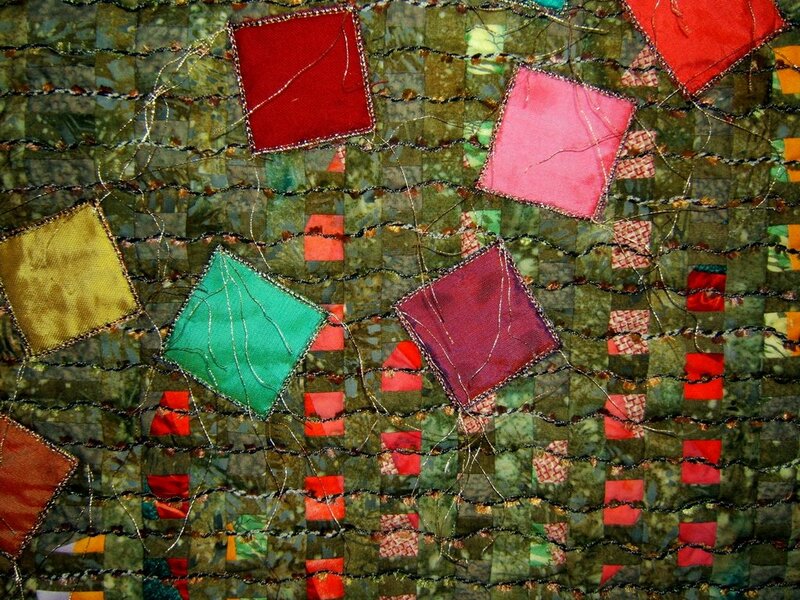 Center squares and "dots" are from recycled clothes. Most others are fabric samples. 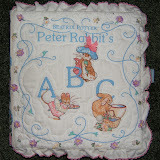 Sashing and borders are cotton chintz. "Criss Cross" is the third quilt I made. It's one I never intended to make. Just before this, I had pieced a twenty-five block top using this same block pattern for a 50th birthday present for my younger sister. The only excitement for me in making that quilt was embroidering the names and birth dates of her six children and many grandchildren in the center squares. 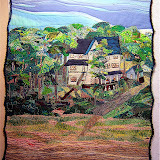 Our mother, Lira Froit, hand-quilted it. 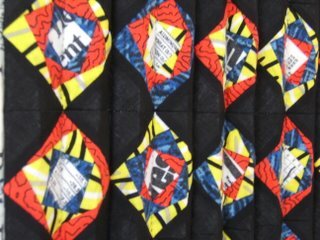 I noticed the secondary pattern that formed when the blocks were sewn together and began to wonder "what would happen if" I ran and connected colors though the design. 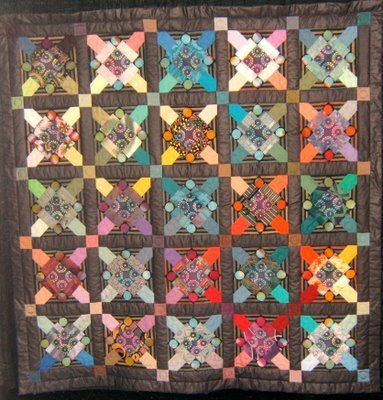 The corner squares are the colors that would happen if the hues on each side of it were mixed together. TVA (Tennessee Valley Authority) wanted to add this piece to their corporate collection. However, I had already given it to my husband for Christmas. When I first started quilting in 1994, I developed what I called "accordion quilting". This form of presentation gives visual movement to geometrical shapes. Consequently, I used it to convey the changeability and action of the stock market. 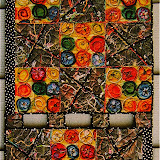 This was made to meet a SMQ guild challenge to make a piece using "primary colors plus black and white". All the blocks are constructed flat like the corners. Viewing from left of center. Viewing from right of center. Description: Like humans, there is beauty in all flowers as well as diversity in their settings. 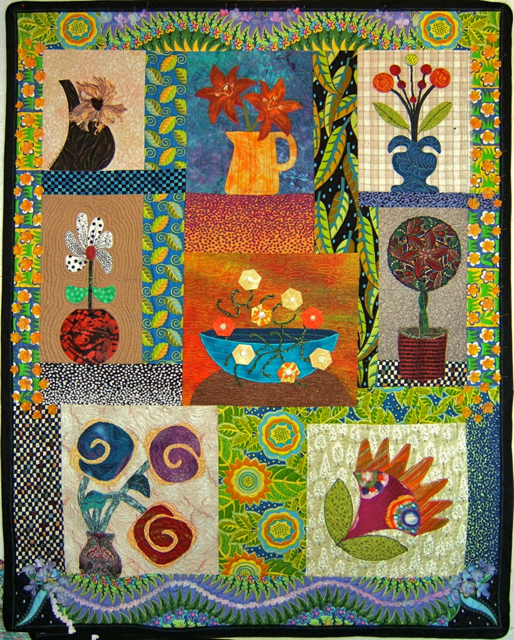 This wall quilt is made up with a collection of "flowers in a container" blocks sewn by Thursday Bee members of the Smoky Mountain Quilt Guild. 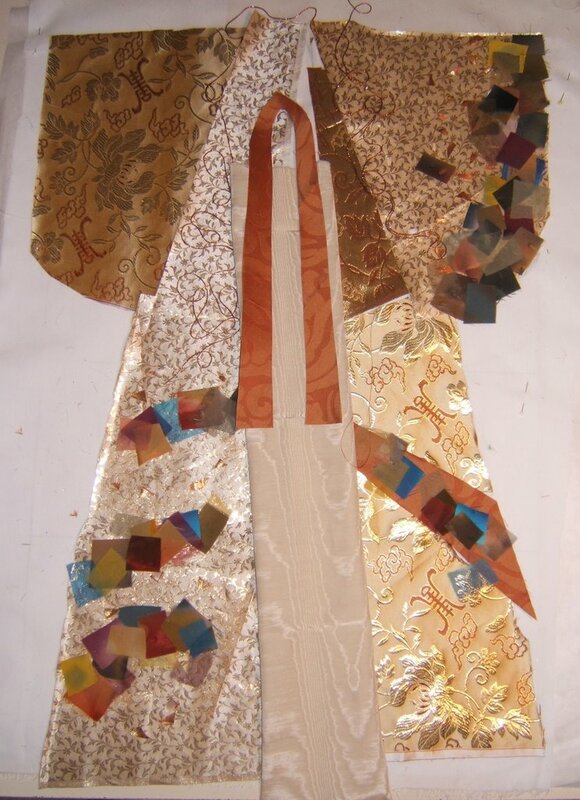 The sashing and border fabrics give an art deco influence to the piece. "Silk" flowers are attached by their embroidered centers, while old buttons from my collection secure the origami folded flowers to the surface. 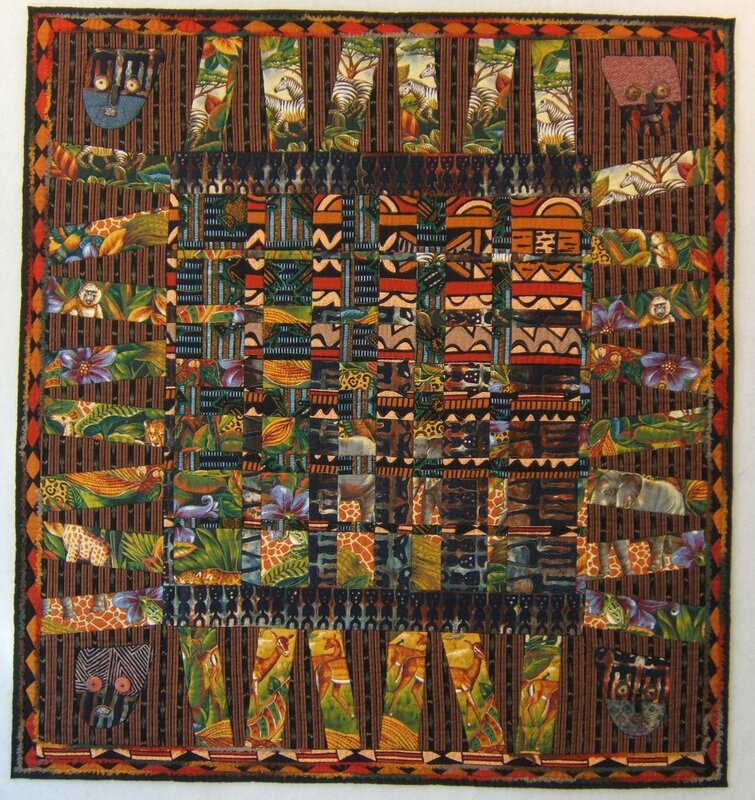 The piece is heavily quilted with designs unique to the pattern of the block and in its surrounding fabric. This is the piece on which I refined my machine quilting skills. The model is a Brother 1500s, a semi-industrial, straight-stitch sewing machine. I learned finer details of operation and settings for this machine from a Yahoo Group. 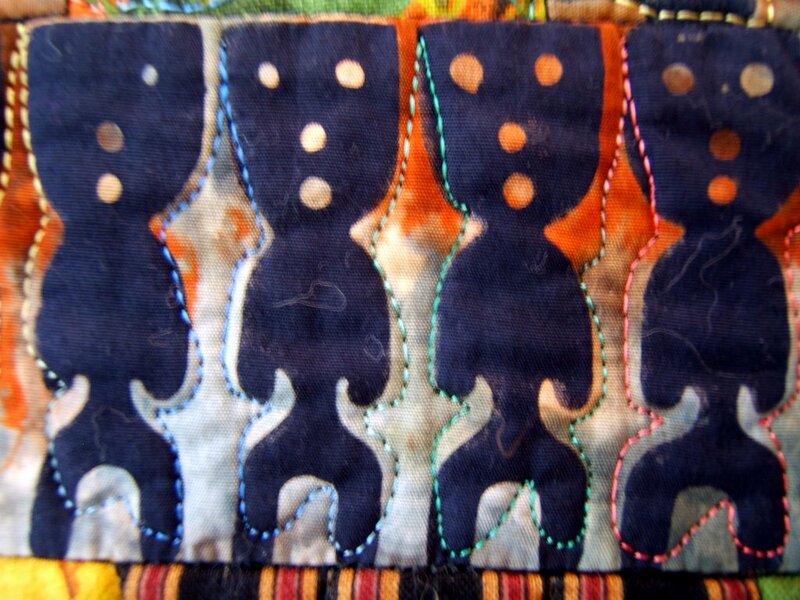 Joining that group eliminated a lot of frustration with stitch tension and thread breakage.